99designs Scam Explained: Why "design contests" don't work. 99designs scam explained: Why ‘design contests’ don’t generate effective design. On the surface, it’s easy to understand why design contests can seem like a good bargain for business owners. They offer a unique opportunity to receive designs from (potentially) dozens of different contestants, all motivated by a single cash prize. However, there’s a reason that ’99designs scam’ is something that people often Google before they launch a design contest. It’s not just the threat of tricks, ripoffs, or fraud involved that makes people hesitate when it comes to design contests. Many prospective clients I speak with want to know if a design contest is a good fit for their needs. Do they produce good results, or are they too good to be true? Many people seeking design expect that for the right person, with the right expectations and skills, a design contest can work. But after I explain the pros and cons of running a design contest, the majority of people I speak with choose to go with a more traditional solution instead of a design contest. The 99designs scam isn’t limited to the threat of being robbed by an anonymous online stranger. There are many issues that prevent design contest websites from generating the ‘good design’ that they claim to produce. If you start a design contest with the expectation of getting a great design, prepare to be scammed. Poor communication between contest holders and contestants, language and cultural barriers, and low overall quality of work (at times even outright intellectual property theft) all play a role. Let’s dive in and paint a nice, clear picture of the 99designs scam in action, and why it’s better to work with a reputable design agency like (shameless plug) Ripley Studios. The hardest part of my job isn’t sketching logo comps, wire-framing out websites, or coding CSS. Most of the challenge in being a great designer lies in the expertise that it takes to translate a client’s needs into a well-positioned brand that will resonate with the right audience. To do that takes an exceptional understanding of the business in question, the market that business competes in, and the audience that business is trying to engage with. I ask a lot of questions throughout the design process. Great design takes great communication, and asking the right questions is a huge part of creating a great brand. The communication options on most design contest websites are limited at best. 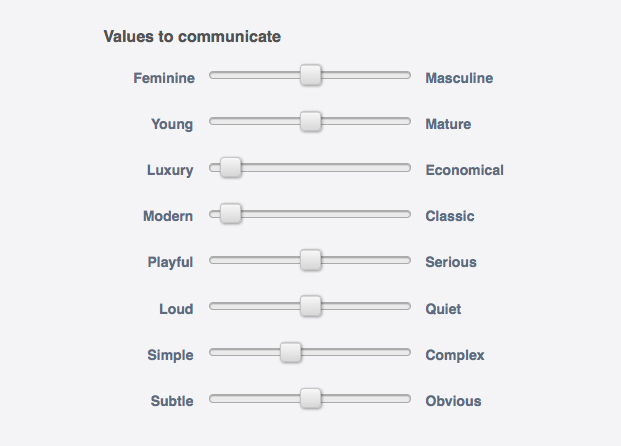 On design contest websites, options for communication are extremely limited. Usually, a contest holder will have space to give a brief overview of what they’re looking for, and that’s about it. There’s no medium for two-way communication to take place, so there’s no way for contestants to ask questions or collaborate with the contest holder. Any mutual understanding between designers and their clients is impossible in a design contest, so creating effective design work is impossible as well. If a lack of proper communication tools isn’t enough, consider that design contest websites draw contestants from all over the world. While most business seek to target a local audience, contestants from places like India, Indonesia, and Pakistan do not have a good understanding of American or Western culture. Many speak only limited amounts of English, and turn to Google Translate to help, which can produce mixed results. This leads to a multitude of issues, from smaller mistakes like misspelled content (I’ve even seen logos with misspelled brand names come out of design contests!) to a complete misinterpretation of the project (think asking for apples and getting bananas instead). To build a successful brand, a designer must understand the context that brand will be viewed in. Such an understanding is not possible without a deep knowledge of the culture that brand will be a part of. Many of my clients are experts in highly specialized fields. When someone launches a design contest, they stray away from their area of expertise, and take on the roll of creative director in charge of the contest. Design contest websites assume that contest holders know exactly what they’re looking for, and exactly how to get it through highly effective creative direction. The problem here is, contest holders are experts in their highly specialized fields, but not in branding or design! I mentioned earlier that translating a client’s needs into a well-positioned brand is the hardest part of my job. It is my highly specialized field. On a design contest website, you’re the one in charge of that part of the job. I can speak from experience when I say that most of my clients aren’t ready to take on that role. They appreciate my guidance and expertise when it comes to branding for exactly that reason. 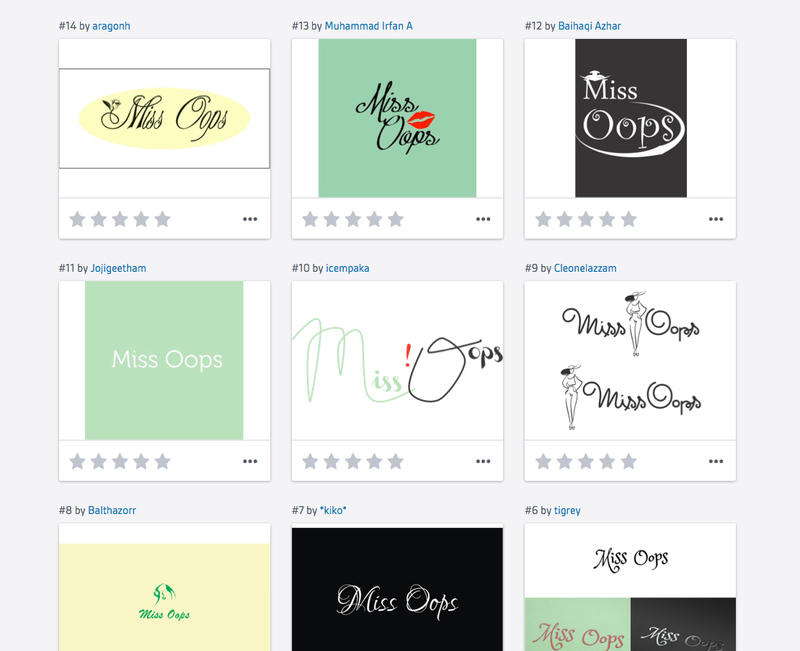 Which of these logo options is right to represent the “Miss Oops” brand? I would suggest that none of them are, and that “Miss Oops” is not a great naming choice either. Another common misconception that design contest websites spread is that a company’s needs can be filled by many different designers in piecemeal fashion. This is not only a 99designs scam, but is common outside design contest websites as well. Designers often hear “All we need is a logo,” or “All we need is a postcard design,” from their prospective clients. Sometimes, it really is true, and all a business needs is X. More often than not though, a company will need X, Y, Z, W, and V to connect with their target audience effectively. Great brands aren’t built on just a logo or just a postcard design, they’re the result of a great brand identity system. It isn’t always obvious, but a single element like a logo represents only one part of the way your brand is perceived by your audience. Design contest websites want you to believe otherwise. They know that creating a great brand takes great communication, expertise, and planning, and they know that isn’t something that they can provide. The design contest business model is built on the premise of choice. And in some ways, that’s exactly what you’ll get. Design contests do get a lot of entries, it’s just that those entries aren’t always the most original, or even aesthetically pleasing, let alone effective. While it’s true that there are a lot of people that enter design contests, I wouldn’t necessarily call those people designers. The word design means, “A process of creative customization that is driven by purpose, planning, and intention.” The fact that someone can operate Photoshop at a basic level does not make them a designer. But that won’t stop them from entering a design contest. Taking a ‘shotgun’ approach and submitting the same design to contest after contest does not make someone a designer. But, it does happen every day at design contest websites. Someone’s ability to rip off someone else’s work and pass it off as their own does not make that person a designer. That’s fraud, not to mention illegal. And, due to the way most design contest websites’ copyright agreements are written, your business will be the one on the hook for damages, not the ‘designer’ (read: thief). These are all too common examples of the low-quality piece of the 99designs scam in action. They are the clearest reasons why you should stay away design contest websites. If design contests don’t work, what does? The bottom line is, real, professional designers don’t participate in design contests. Professional designers know all about the 99designs scam, and they know that contests don’t work. If you’re looking for great design, a better solution is to hire an experienced, reputable design agency. Professional designers are experts who love what we do. We are ready to answer your questions, and we want to make your design project easy, rewarding, and successful. If that sounds good to you, skip the design contest, and give Ripley Studios a call. We can’t wait to hear from you, whether you just need some free advice, or a whole new brand. 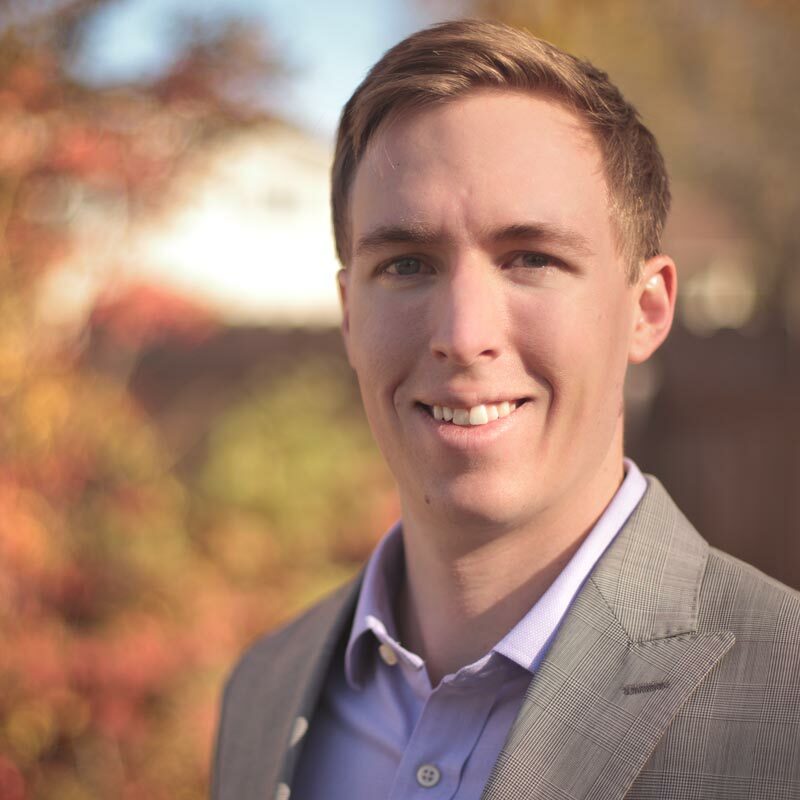 Nathan Ripley is owner and creative director of Ripley Studios, a Lakewood, Colorado graphic design agency. He has a B.A. in graphic design from Carthage College, and has more than five years experience working in the field. Ripley Studios is available for hire by companies seeking to disrupt, outcompete, and increase revenue through exceptional design. There are lot’s of crap in 99designs… that is for shure! But they usually clean that ones after a period. Why are freelance designers (like you) a great choice?!?! there are lot’s of freelancers that are really bad!! that is not only in 99designs! A great designer is a great designer and there are lot’s of them in 99designs. I agree with all the things that you have written, except that part! You’re right that there are a few good designers on contest sites, as well as many bad ones. So what gives a good independent designer or agency an advantage over a good designer on a contest site? I would put a lot of stock into the idea that effective design takes communication and planning. While you may end up with work that is aesthetically pleasing from a design contest, it isn’t going to be very effective, because that crucial communication and planning can’t take place. Also worth mentioning is that it takes a lot of effort to implement design. Contest websites doesn’t offer the kind of working relationship between designers and clients that is necessary for proper implementation of major projects. For some businesses, that isn’t a problem, particularly if all they’re looking for is something quick and simple. For others, it’s another dealbreaker that they don’t necessarily know about until it’s too late! You are insane, The best designers don’t participate in 99designs. Well, you said it, not me! I will agree with Renato that there are a few talented (but misguided) artists on 99designs. That said, they usually don’t last long. It doesn’t take a genius to recognize the 99designs scam in action and head for higher ground. Professional designers do not compete in design contests! Firstly, I was curious about having my logo designed on 99desings, but after going through some reviews I backed off. This blog posts opened my eyes, in combination with http://logoinsider.com/. Thank you for sharing the truth, insted of praising the damn site for affiliate commissions. I can not express express enough the value you provide for readers! You’re very welcome, I’m glad I could help. why should not design professionals compete in contests? are they affraid of losing. by your judgement artists get payed high and if not theyre not artists. cmon dude even artists should earn for living their life and trust me i have seen plenty of artists on design contest sites like 99designs. The message behind this post isn’t about “being scared to compete,” the competition is much tougher out in the wild than it is at 99designs. And it isn’t about blaming artists like you for doing what you’re doing either, because if I were in your shoes, I would probably do the same thing. What I’m saying here is that 99designs and the ‘design contest’ model itself is not conducive to creating good design. It just doesn’t work, and that’s not your fault, it’s theirs. And about that $200 prize you mentioned—99designs charges a contest holder a minimum of $300 for their lowest level contest. They take that extra $100 out of your pocket and put it in theirs, and a lot more of that money should be yours for the disproportionate amount of work you’re doing. They’re a bad place for business looking for effective design, but believe me, they’re even worse for designers looking to make a living. There are no quality computer operators in 3rd world countries that understand 1st world branding and design. 99 ‘s…. competition portfolio work is proof of that – A very low standard. Crowd sourcing is a no, no in building a brand. They should change their name to 99 Low End Computer Operators. Pay for 1, choose and get the other 99 fools to work for free. Designers don’t work for free. The paying client knows “f..k” about design & branding, doesn’t even know what he/she is looking at, so how the hell can he/she be the judge of what a good design is. When a brief is given, a development process takes place from start to finish. Not a pick and choose or hit and miss situation.”I Like it” or “I Don’t Like It” etc. . “GOOD DESIGN IS GOOD BUSINESS”. Wake up you fools. Real Professional Designers don’t even pitch for work. They get all their work based on knowledge, talent and professional reputation. The owners of 99ComputerOperators should be fined closed down and deported for using the word “designs”. It’s an insult. 99designs is a good place to gain experience as a designer. If you win or lose, you gain experience. But you cannot rely on spec work for a living. I join 99 design contests for experience and some fun, not to earn a living. As a designer, I won’t let any design contest influence my personality and outlook, rather, I let it shape my skills and how I communicate with design holders. These are nice people. My advice to all aspiring artists: join only blind contests with a guaranteed prize and do not submit your best work, unless you’ve won. If you are looking for designers, listen to NATHAN RIPLEY. I simply can’t understand why they will only post CONTESTS instead of jobs. Why would I waste time producing a sample to a client that may never chose it. Its a total waste of time. I have just concluded a great “design contest” with 99designs and find that my experience is the complete opposite than what you portray. First, please understand that I am a former freelance photographer, newspaper editor, and marketing professional with more than 30 years of experience in those fields who not only hired designers for my staff but have used freelance designers as well. 99designs is a pure “open market” where designers are competing every day. Also, your statement, “Effective design takes more communication, understanding, and research than a platform like 99designs can provide” obviously comes from a BIASED approach to design. 99designs is just that, a platform for designers to connect with individuals who need design work done. The understanding and communication that I have experienced in the past with freelance designers has been both bad and good and it had nothing to do with the platform… be it Yellow Pages, Google Search, or 99designs. Your bias comes from your background and what I call, “design snobs” who think that you have to come from the US, go to college or a high priced art school to validate your designs as good or not. Gimmie a break! I don’t care whether you live in the USA, India, the UK, or just crawled out from under a rock, if you can provide a design that meets my needs at a price I am willing to pay then great. Let me ask you… if I were to pay you $799 would you come up with more than 100 designs in color, art work, images, fonts, design ideas, etc.? Nah, I really doubt that you would. For my $799 I got more than 100 designs, some bad, some okay, and some FANTASTIC. 99designs is a marketplace platform, the end user is the one who determines if the work fits their needs, not the platform. Just because you have a “design snob” mentality, don’t throw the baby (designers) out with the bathwater (99designs)… maybe you need to rethink your narrow-minded and unfounded position. Competition always brings out the best, and I know some designers can’t stand the blow to their ego by losing a design to someone else! You’re right, I don’t show my clients 100 different comps on any particular project. The goal of a design project isn’t to wade through hundreds of ineffective designs that don’t fit the brand. The goal is to create the one design that works perfectly. What you need to design a great brand is efficacy. Not variety. Design is results driven. That’s not being a “design snob,” or “biased,” that’s the reality of a design or branding problem. At 99designs, you’re hoping that one of those 100 comps you get will be effective enough to use and solve your problem. With a real designer, you get the expertise it takes to create an effective, powerful brand, and solve your problem, guaranteed, every time. You certainly seem confident in your creative ability. Many business owners aren’t. They aren’t former creative professionals, and their results aren’t like yours. They feel overwhelmed by the design process, and unsure of how to best brand their product. They don’t feel well equipped to solve their branding problem, and they don’t know where to begin. Those are the people I’m here to help. 99design is a business, they have thier own designer that serve as staff. if you are almost winning then be careful they will find way to suspend your account. and of course the winner will be their own staff. the staff is unfriendly. Absolutely, it happened to me, I was a finalist in two book cover contests, designs hand painted by me and both pulled as I was chosen as one of the finalist in each contest, now the authors of the books holding the contests can’t even have the opportunity to choose my design as the winner, best I can figure is 99d… Took the image I uploaded, kept the prize money and shut me out.